The Earth moves in a circle round the Sun. Well, actually, it's not a circle but a very nearly circular ellipse. This is something you can calculate from Newton's laws of gravitation and motion. Similarly, you can calculate the motion of any system of two celestial bodies that exert a gravitational pull on each other. All you need to know are the bodies' masses, their initial velocities and respective positions, and off you go. What if you have, not just two, but three, four, four or more celestial objects each exerting a gravitational pull on the others? What can you calculate then? The answer is, not very much, at least not in general. The problem of determining the paths that n bodies will trace out for all future time is known as the n-body problem. And it turns out that when n is 3 or larger, the paths of the bodies generally become horrendously complicated. It has been proven that a neat mathematical formula that describes these paths doesn't exist (see here). 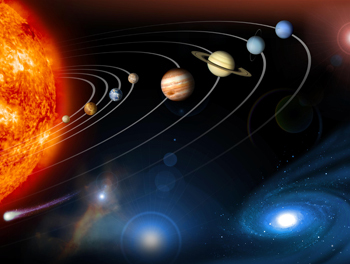 The reason we can get a good idea of the orbits of the planets in our solar system is that the planets are so small compared to the Sun that the gravitational pull they exert on each other can be neglected. To work out the path of a particular planet, you can only take the pull coming from the Sun into account to get an answer. You can find out more about the 3-body problem here and about approaches to solving n-body problems in the video below, featuring the mathematician Katie Steckles.